Chris Bird wrote the handbook for dowsing. Marines were taught Military Dowsing for tunnels and more. "To dowse," says the author of this definitive study of the divining art, "is to search with the aid of a handheld instrument such as a forked stick or a pendular bob on the end of a string - for anything: subterranean water flowing in a narrow underground fissure, a pool of oil or a vein of mineral ore, a buried sewer pipe or electrical cable, an airplane downed in a mountain wilderness, a disabled ship helplessly adrift in a gale, a lost wallet or dog, a missing person, perhaps a buried treasure." Co-author of The Secret Life of Plants, Christopher Bird has filled this book with exciting, documented stories, most of them illustrated with photographs and diagrams. It provides a complete history of the art of dowsing around the world and discusses in detail the various existing theories attempting to explain this extraordinary phenomenon. 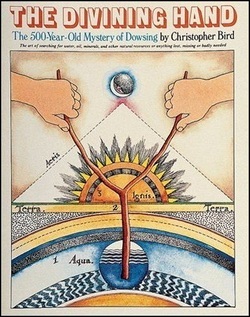 The late Christopher Bird took a documentary view of the whole subject of dowsing, from it's earliest history to the present day, in the fields of water divining, mineral and oil exploration, tunnel and cave location, missing objects, animals and people, geopathic stress, medical diagnosis, and Soviet dowsing protocols, including both physical and remote sensing. Willis Harman (August 16, 1918 – January 30, 1997) was an American engineer, social scientist, academic, futurist, writer, and visionary. He is best remembered for his work with SRI International, for being president of the Institute of Noetic Sciences in California, and for his work in raising consciousness within the international business community. Early life and education Harman was born in Seattle, Washington on August 16, 1918. He graduated from the University of Washington in 1939 with a B.S. degree in Electrical Engineering. After graduation, he worked for General Electric and then joined the Navy as an electrical officer. He was stationed on the USS Maryland (BB-46) but was ashore near Pearl Harbor on December 7, 1941. After the end of World War II, Harman received his M.S. in Physics and Ph.D. in Electrical Engineering from Stanford University. He has three daughters, one son, many grandchildren, and six great-grandchildren. He had a rose garden and a swinging horse in his backyard. Career Harman taught for several years at the University of Florida before joining the Stanford faculty in 1952. He eventually left Stanford to become a senior social scientist at SRI International where he initiated a futures research program, exploring the national and global future. In this capacity he worked on long-term strategic planning and policy analysis for an assortment of corporations, government agencies, and international organizations. He then served as president of the Institute of Noetic Sciences from 1975 until his death in 1997. During the 1970s, he was appointed a regent of the University of California by then governor Jerry Brown. While a professor at Stanford University in 1968, he taught a course called "Human Potential"' which covered different areas in Spirituality and Consciousness. Writings by Abraham Maslow, Carl Rogers, Fritz Perls, and Will Schutz were among the subject matter. Prof. Harman held several of his classes at his home, which was not commonly done. "Human Potential" became a very popular course at Stanford and it influenced the lives of students who took it in significant ways. An Incomplete Guide to the Future (1976/1979). "Obituary: Willis Harman". The Futurist (World Future Society) 31 (3): 59. May–June 1997. ISSN 0016-3317. Tapes are generally sold as sets; see catalog.